Parker Ito subverts the idea of the exhibition. 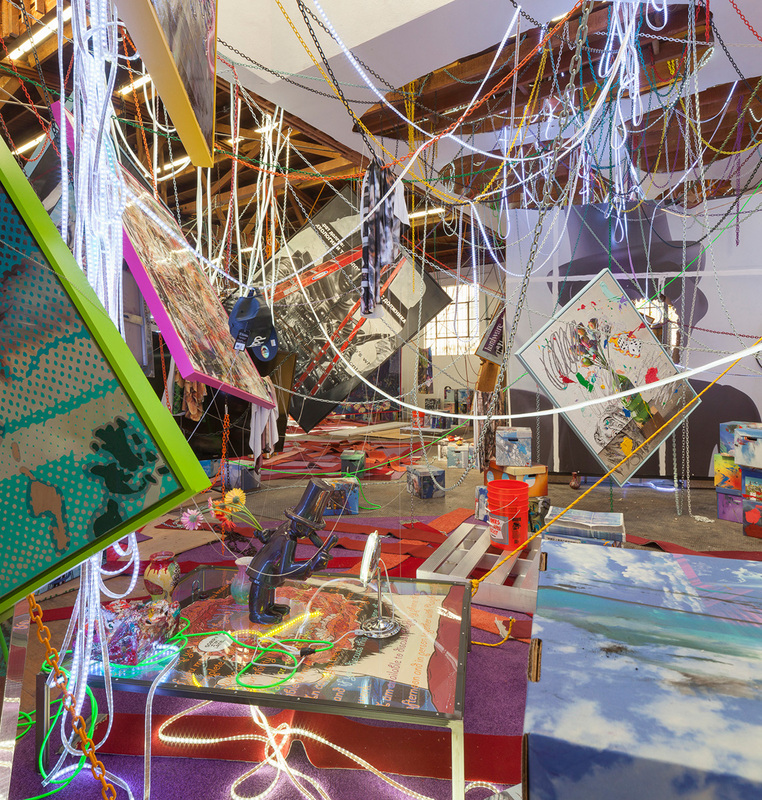 Parker Ito: Installation view of A Little Taste of Cheeto in the Night at Château Shatto, Los Angeles (January 24 − May 9, 2015). 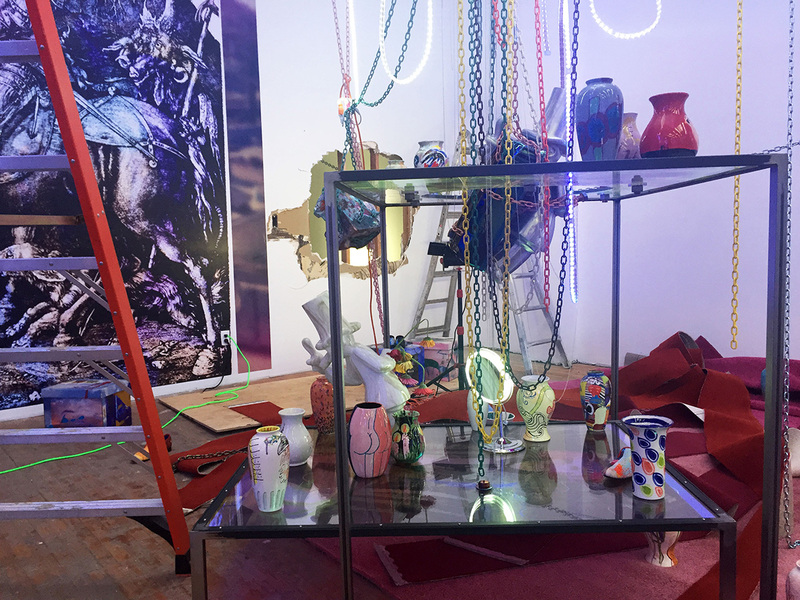 Parker Ito: Epilogue: Jeanne d’Arc #1 (2015) with vinyl backpack, installation view at Chateau Shatto, Los Angeles. All images courtesy Château Shatto. Photography: Elon Schoenholz. Parker Ito (a.k.a. Deke McLelland Two, Creamy Dreamy, Parker Cheeto, and now PI), works out of Los Angeles and has evolved a practice that has brought the language of the network beyond the confines of Net and Post-net art genres into a space entirely his own. As if breaking the code of the gallery walls weren’t enough, Ito has spent the last year presenting an expansive series of exhibitions that subvert not only the ideas of exhibitions themselves, but also of the ability to place value on single artworks out of context. To understand his exhibition Epilogue: PBBVx4.5213418505240406714305462110190527PPPPPPPPPPPPPP at Château Shatto in Los Angeles (May 2 – June 6, 2015), one must review the series that it serves to close. Parker Ito: Epilogue: PBBVx4.5213418505240406714305462110190527PPPPPPPPPPPPPP (jpg4), 2015. Digital print on canvas and polyurethane stretched on aluminum panel, anodized hardware, tubing, pump, five gallon bucket, vinyl backpack, latex mask, blk water, rubber band, comic, vintage postcard. 94 x 120 inches with variable dimensions. 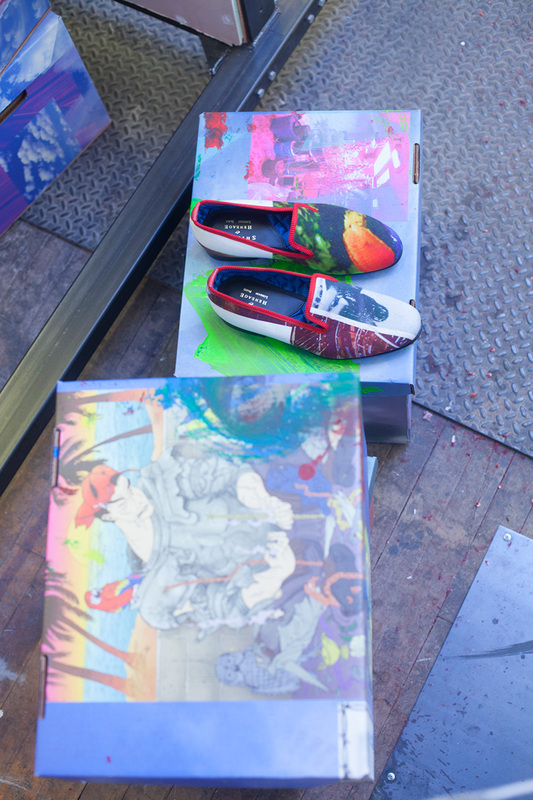 The series began with Prelude: Cheeto Returns (Rainbow Rose Still Lifes at Kaldi Coffee and Tea), 2014, featuring anonymous paintings of multicoloured roses displayed at a coffee shop in the Atwater Village of Los Angeles. It continued in Part 1: Parker Cheeto’s Infinite Haunted Hobo Playlist (A Dream to Some, a Nightmare to Others) by L’atelier de PPPPPP (2014) at Smart Objects in Echo Park, with anti-gallery installations of neon, LED lights and paintings installed by breaking through the gallery’s walls or dangling them over open spaces. Ito then crossed the pond with Part 2: Nora Berman, Blackwidow LA, Parker Cheeto, Carey Garris, Justin John Greene, Celia Hollander, Daniel Lane, Lee Marshall and Orion Martin: Maid in Heaven / En Plein Air in Hell (My Beautiful Dark and Twisted Cheeto Problem), 2014, at White Cube gallery in London. As part of the exhibition, he credited the assistants he employed to create the show’s paintings, and had the gallerists’ children paint on top of these works, which were displayed on walls and hung askew from the ceiling. The series culminated with A Lil Taste of Cheeto in the Night (2015), an extravagant installation at a warehouse next to Château Shatto in downtown L.A., in which all of the previous works, as well as many others, were installed in a harum-scarum mass using all the previous installation techniques: swinging paintings, video installations, chains, LED tubes, assistant-painted vases, custom-printed shoes, bath towels, fake palm trees, sculptures of the Western Exterminator logo and so, so many roses to create a compilation show that was almost impossible to document properly. Parker Ito: Epilogue: PBBVx4.5213418505240406714305462110190527PPPPPPPPPPPPPP, Pump #3 (2015). Pump, bucket, plastic tube, mounting hardware, blk water. Dimensions variable. Installation view at Château Shatto with 'Epilogue: Jeanne d’Arc #2'. Through this extreme and ambitious approach to displaying his work, Ito has created a chronological representation of a user’s experience online, in which exposure to a certain set of images across a handful of websites evolves over time as those images are re-appropriated, repurposed and reposted on an ever-expanding entropic mess of sites and social networks. His series unpacks the modern phenomenon of the viral image, interpreted through his idiosyncratic visual vocabulary, including corporate icons from the Los Angeles landscape, Linux software, video games, popular music, comic books and skate culture, bringing these images into the physical realm for the viewer to enter and confront. Epilogue then, serves as a clearing of the screen, so to speak, and offers the cleanest and most effective expression of this thesis. 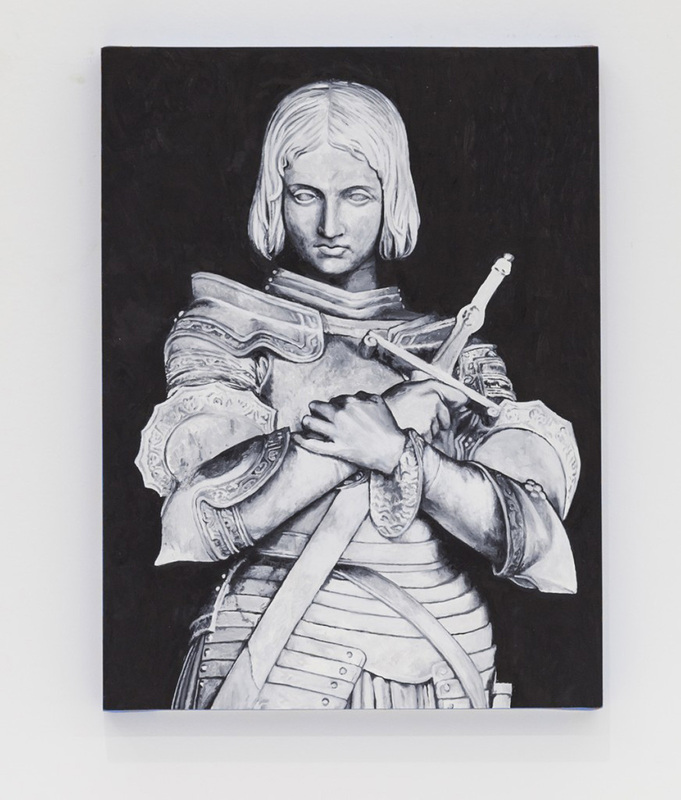 Parker Ito: Epilogue: Jeanne d’Arc #1 (2015). Oil on canvas stretched on wood panel, 12 x 18 inches. Walking into the show, the viewer encounters a small oil painting of Princess Marie d’Orléans’ 1838 sculpture of Joan of Arc, Prière avant le combat, hanging in a clear pink plastic backpack, and turns to locate the source of a certain sound that is both mechanical and organic. 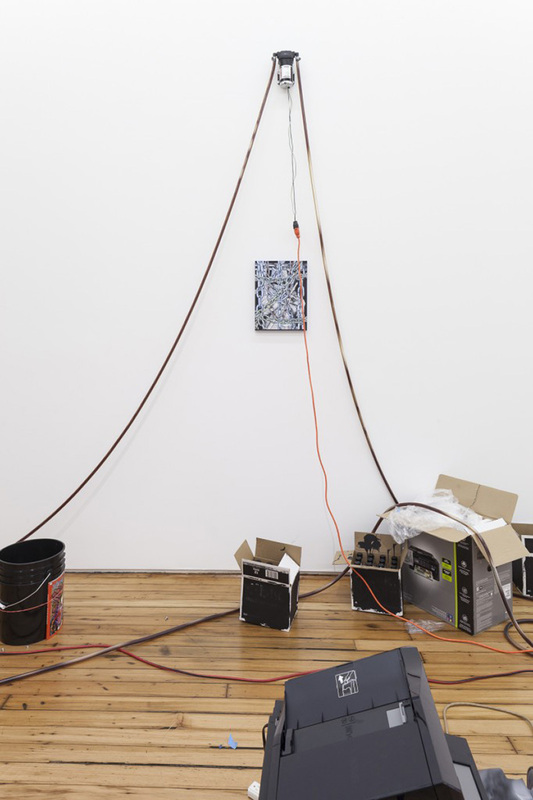 Upon shifting, the viewer takes in a chaotic installation of PVC tubing running over the floor, walls and ceiling, pumping black liquid into— and out of — buckets spread throughout the gallery space on, above and alongside various paintings. 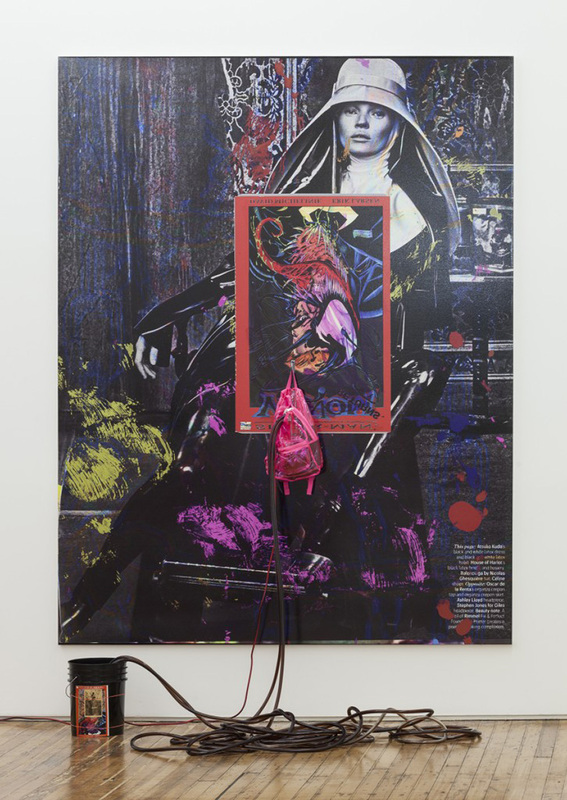 On the first visit, it’s nearly impossible for a viewer to take much away other than the repetition and juxtaposition of the sparse visual elements — Erik Larsen’s cover of the Spiderman: Venom Returns comic book, the aforementioned image of Joan of Arc, Steven Klein’s photograph of Kate Moss in a full-body black latex nun’s habit (for W Magazine in March 2012) and the tubes. However, if one pops online to the gallery website and notes the naming and numbering system of these elements, a certain order emerges and meaning becomes legible through this abstract online/offline interaction. Thus, Ito provides his final and most elegant point in the series: that the offline world has gathered so much visual and physical clutter that the only way to make sense of the chaos is through the guidance of the network. But, even then, chaos persists as the works listed on the gallery’s site are out of numerical order, and instead presented in spatial order. Ito’s work requires much of the viewer before reaching the traditional moment of “making sense,” but also succeeds in providing the just- as-important experience of getting lost in the entropic mess of non-sense. Walking through the show a second time, now armed with a handwritten reordering of the digital guide, Epilogue takes on a new sense of order and meaning. In following the numerical order, the audience must crisscross the floor, beginning with an introduction to the Jeanne D’Arc #1 painting in the backpack, Pump #1 — simplest construction of a black pump in a black bucket, pumping a black pool of mineral water — and jpg1, a large digital print of the same Joan of Arc image with notable copy burn. With each step up in the ordered path, the elements become further distorted and mixed, approaching a climax with jpg4 and Pump #5, in which the huge digital print of the fashion shoot is superimposed with the Venom cover, and pierced with another pink plastic backpack, now filled with PVC tubing that runs in and out of it, and ultimately into a pump beneath an Epson printer (on whose scanner tray Ito has wedged a rubber Venom mask and a bronze miniature Joan of Arc statue). The pieces resolve from there to a large digital print of the same fashion photograph, with Ito’s own face superimposed on it ,enclosed in a pink plastic backpack, the background of the image turned into an extremely low-resolution pixilation of the original. Here, at the end of the main floor of an exhaustive show, a gallery attendant helpfully suggests you view the final room in the basement and, after climbing down the stairs, you can’t help but laugh as you find two large, looping spools of PVC tubing hanging from holes in the floor above into the centre of the basement filled with three-foot-tall marijuana plants. Ito closes the series with the simplest of reminders that no matter how far you go to derive meaning from the dense, the networked and the intricate, there will always be a question and mystery that remains. In Artforum this year, Ito explained to writer Chris Kraus what he thought about content: “It’s not equivalent; it’s a filter. I’m invested in the sensation of things.” Epilogue then, is a successful manifestation of that thought, and offers viewers more than enough to process until his next endeavour begins. D.S. Chun is a writer, filmmaker, and artist living and working in Los Angeles. His fiction and poetry have been featured in Native Split, Dum Dum Zine, Entropy, Enclave, and Deru’s 1979. His film, All Hallows & Boulevards is currently hosted by Entropy. He founded the artist’s process site Way Out (thatwayout.com), curated D.C.C.S. 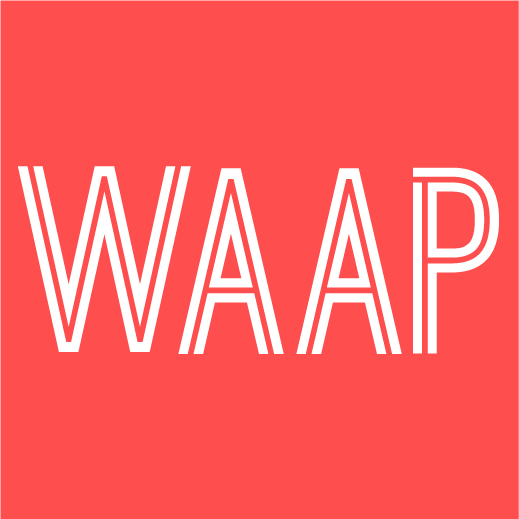 – a group show in Seoul, founded the Watch What You Eat dinner series, and co-founded Technobook.club. He is currently working on a new ethnographic essay, video, and media art piece alongside other essays of art, culture, and film criticism.